Published by Cyril Huze January 24th, 2018	in Builders, Editorial and Events. 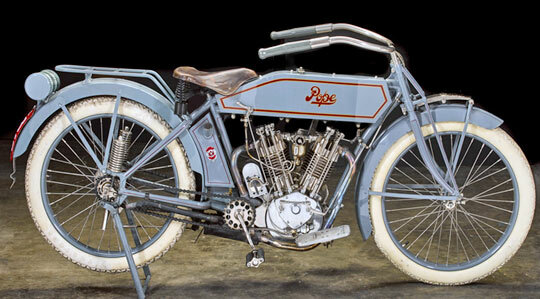 A 1914 Pope 61CI Model bought by the Great Escape star in the late 1970s just a few years before his untimely death, has emerged for sale by the Bonhams Auction House this Thursday, January 25th, at the Rio Hotel & Casino in Las Vegas. McQueen’s purchase of the bike came as the result of long trips spent scouring the countryside with close friend and legendary stunt driver, Bud Ekins. McQueen added it to his huge collection of automobiles, but when he died suddenly of cancer in November 1980, unlike most of his machines, the Pope was sold privately and not at auction. The Pope was purchased by Otis Chandler, a well known publisher and proprietor of the Los Angeles Times. He placed the 1,000cc bike on display in his personal motor museum in Oxnard, California before selling it years later to an established collector in classic motorcycles. The bike remains in superb condition and its pale blue bodywork appears without a scratch. It has white tires and deep red markings identifying the it as a Pope. 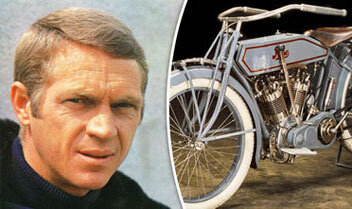 It has a top speed of around 70mph and its connection to McQueen is expected to add considerably to the bike’s value. Steve McQueen’s collection was incredible. Its a shame it could not have been kept together and put on display. I guess the only problem with that is the younger generation, millennials, probably haven’t heard of Steve McQueen ! And to think that the Pope could be bought….heaven forbid! Pretty sure this is the same one that did not sell at Mecum the same week for not hitting the reserve? McQueen’s Henderson was the lot right before it and fetched $100,000.